February 23, 2009 by Ken Ward Jr. This undated AP photo shows the W.R. Grace vermiculite mine near Libby, Mont. After years of delays, the people of a Montana mining town are getting their day in court to see a major chemical company face federal charges accusing it of poisoning their homes and schools with asbestos, according to The Associated Press. W.R. Grace and Co. and five of its executives are charged by federal prosecutors with knowingly exposing the residents of Libby, Mont., to the fibrous mineral linked to cancer. The Libby disaster came to light thanks to the investigative reporting of Andrew Schneider of the Seattle Post-Intelligencer. His original series of articles, Uncivil Action, is available here. First, it killed some miners. Then it killed wives and children, slipping into their homes on the dusty clothing of hard-working men. 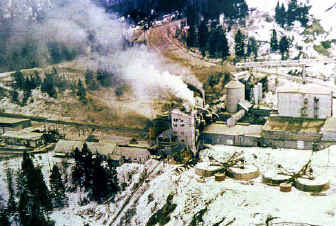 Now the mine is closed, but in Libby, the killing goes on. The W.R. Grace Co. knew, from the time it bought the Zonolite vermiculite mine in 1963, why the people in Libby were dying. But for the 30 years it owned the mine, the company did not stop it. Not the town of Libby, not Lincoln County. Not the state of Montana, not federal mining, health and environmental agencies, not anyone else charged with protecting the public health. Along with the enormous deposits of vermiculite in the earth of nearby Zonolite Mountain are millions of tons of tremolite, a rare and exceedingly toxic form of asbestos. For eons, the tremolite lay undisturbed and harmless beneath a thin crust of topsoil. But mining the vermiculite has released the deadly asbestos fibers into the air. A Post-Intelligencer investigation has shown that at least 192 people have died from the asbestos in the mine’s vermiculite ore, and doctors say the toll could be much higher. The doctors and Libby’s long-suffering families say that at least another 375 people have been diagnosed with fatal diseases caused by this silent and invisible killer. Schneider is one of the absolute best in the business, and is still following the Libby situation on his blog, Secret Ingredients. His book, An Air that Kills, is well worth reading. They’re also doing Twitter updates.